While we can sometime meet very demanding deadlines, sometimes our customers show just how quick they can be. This customer picture was sent to us within 24 hours of us emailing it to the customer. As you can see they have used an attractive wooden frame to show of the caricature of the subject who is about to retire and spend time traveling and playing golf. Thank you so much for helping me get such a great last minute gift for my dad’s retirement. It was definitely something he never expected! Zalo did a great job – it’s even better than I hoped it would be. And the customer service I got from Matt was fantastic! I’ll certainly recommend caricatureking.com to my friends and family. 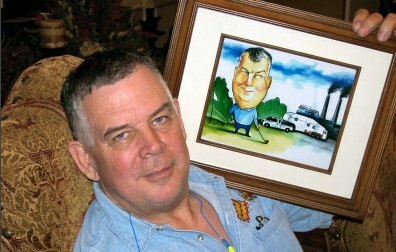 Here’s a picture of my dad with his caricature.